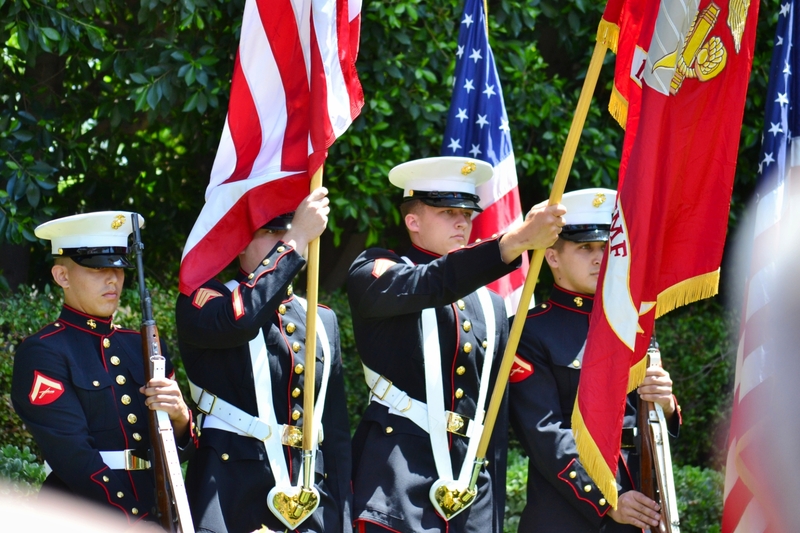 Marines participate in a presentation of the colors on Memorial Day. Edward Nixon, 84, the youngest and last surving brother of President Nixon, takes part in a Memorial Day wreath-laying ceremony at the Nixon Library. Lt. Gen. John Toolan, the commander of the 1st Marine Expeditionary Force, greets a man who said he was a Marine at the Memorial Day ceremony. Lt. Gen John Toolan, the commander of the 1st Marine Expeditionary Force, and Edward Nixon, 84, the youngest and last surviving brother of President Richard Nixon, took part in a Memorial Day ceremony at the Richard Nixon Presidential Library and Museum on Monday, May 26, 2014. The ceremony, which included a wreath-laying and a Marine presentation of the colors and 21-gun salute, was followed by a keynote speech by retired Gen. James Mattis, the former head of the U.S. Central Command. Next Post Isla Vista shooting resurfaces old debates about gun control, mental health and … the media?